You might be surprised to hear it, but I’m actually a huge fan of oak cabinets…that’s right, a HUGE fan. Why? Well, unlike melamine, thermofoil and veneers, oak cabinets are almost always REAL solid wood. And with real wood comes real potential. Now I’m sure you’ve heard me talk about painting/staining oak cabinets to update and add value, so today we’re going to talk about everything BUT that. Antique Brass. If you’re looking for a low-contrast look, antique brass is a beautiful finish with oak cabinets. The bonus is that most oak cabinets (if they have their original hardware) have hinges in this colour, so that’s just one less thing to worry about! Oil Rubbed Bronze. Another beautiful finish with oak cabinets, adding a bit of contrast and drama without being as stark as black. Julie Blanner did a FABulous job of updating her kitchen while keeping the rich tone of her oak cabinets. With cup style pulls and decorative handles, her kitchen looks warm and inviting! Now the cathedral style door (as shown above with the arched top) is the hardest look to update as a shaker style/square frame is a more modern style. 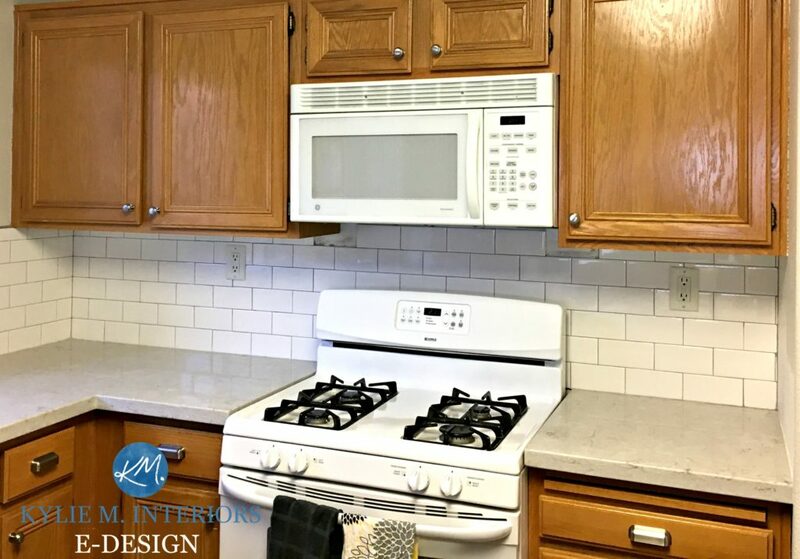 By choosing hardware with soft, curved lines, Julie managed to give this kitchen a new lease on life and the cathedral style door/hardware look natural and well-coordinated. Adding glass to a few key doors will relieve some of the visual weight of the wood and add some reflective value to your kitchen. Seriously though, want to know how Confessions of a Serial DIY’er has a great ‘how-to’ as does my gal Tamara over at Provident Home Design. Using unified decor with a consistent colour palette can really help to update a kitchen or bathroom with oak cabinets. The more colours and metal finishes you add, the more cluttered it can make things look. Black, white, cream, gray – these are all classic, simple colours to add to a room with oak. Rather than contrasting the wood with a colour like blue/green, keep things simple with some well-placed neutrals. Copper is a beautiful complement to oak cabinets with its earthy rich metal finish. 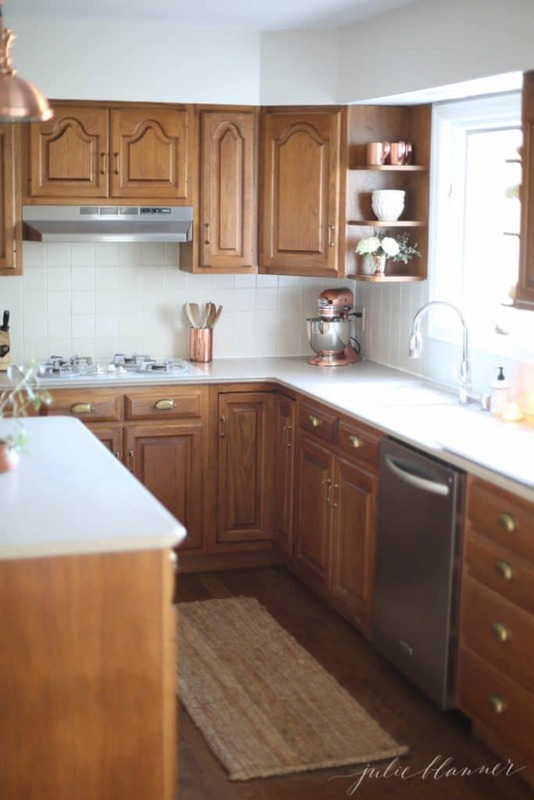 Whether it’s canisters or small decorative pieces, adding copper can help to simplify and unify your cabinets and your decor as copper tends to have the same warm undertones as oak. The use of greenery keeps the accessories in this room well-connected and complementary to the oak cabinets. Remember, oak is already a ‘busy’ look as it tends to be pretty grainy – keeping thing simple with your decor will help to calm things down. Okay, so I’m a big fat liar, I know – slap me with a wet noodle. However, this idea doesn’t involve painting ALL of your cabinets – just some of them, and it’s too good of an idea not to share! By choosing a few key places to paint you can give your kitchen an updated look and give the oak something to play off of. Whether you have an outdated backsplash or none at all, adding a more modern looking backsplash will do WONDERS for your oak cabinets! The most popular, timeless choice would be a white subway tile with white or gray grout, however, this doesn’t suit EVERY countertop. You can also check out travertine which is a beautiful natural stone and then choose a colour range that falls in line with the other products in your room (travertine is FAB with most oaks). Check out my affordable and FUN E-Design and Online Color Consulting Packages – I’d love to help! I do have a question, and you may have answered it in other posts…what do you think about the kitchen cupboard paint kits they sell at Lowe’s and Home Depot by the paint? Do they work? If you know. Thanks again for a great and informative post! We have allot of counter space and could not afford to replace it so we chose to do a counter paint kit and absolutely love it. It was very easy. There are a few downsides though, the first being that it’s inconvenient not to be able to use your counter space for several days. You do have to be very careful not to set anything hot on it because it will take the finish off (we found that out the hard way). We do have a few nicks here and there after only a year but they are very easy to touch up. Sweet, I love notes like this – thank you Kristin, I’m glad it turned out and I bet it was a FRACTION of the cost! Just beginning to think of new counter tops for my 1992 kitchen with honey oak cathedral cabinets. Our house isn’t worth what we paid for it, so I wouldn’t touch it otherwise, but the sink is rusting and of a giant size that can’t be replaced. Time to re-do sink, counters, etc, but on a budget. Just getting started to figure out how to go and a style that will be attractive though the cabinets are not in vogue. Thank you so much for these fantastic ideas! My family and I are house hunting right now and practically every house we look at has my least favorite kitchen design – oak cabinets with tile countertops! Ugh! I didn’t know what to do until I came across your site. Thank you again for giving me hope! I refreshed my oak kitchen with new quartz counters, backsplash and farm sink. The Kohler Whitehaven “short apron” style sink can be installed on a standard sink base. It is a great way to blend “old” country with new farmhouse. I love my refreshed kitchen. I have replaced my upper cabinets with oak cottage white-the oak grain can be seen. I want to match my island which is oak/grain with antique white. But I want the grain of the oak to show through like my other cabinets. How do I do that? Well, I’m thinking that if you just use a quality primer and paint that should do the trick! It actually takes some work to fill in the grain on oak (which is why most people don’t do it). You’ll also want to make sure that you use the same sheen level as you have on your other cabinets as the sheen can affect how the grain looks as well. Take one of the doors that is a bit more hidden and do a trial run (or go to a building recycling store and get a few doors to play with). This way you can get a feel for how things will look when they’re all done without getting too far ahead of yourself! Thank you! I thought I was doomed to wake up each morning and walk into my new home’s oak cabinet kitchen which I dislike to depression. You have given me so many useful ideas. I’m having fun incorporating most of your recommendations. Wahoo, that’s what I like to hear Kathy – thank you! Can I start by saying that I’m a fan of my oak cabinets. They are made of solid wood and plywood…no particle board, no thin and cheap veneer! After thirty years they look as good as new, and stainless steel appliances and an off-white quartz countertop have brought them into the new century nicely. I love the mix of old and new! And I love the warm tone of the wood, I just can’t imagine painting it! Here’s the thing, if you chase kitchen trends, you will always be unhappy because, like clothing trends, they always change. Remember when everyone had to have cherry cabinets with darke granite counters? Exactly! I agree totally I have the same cabinet you talk about and we paid a pretty penny for them, I think I may and try to incorporate a few glass doors on the top cabinets. Doors with a semi-frost design and then update my hardware. Give me solid honey oak cabinets over fake wood, particle board or plastic thermofoil any day. You can stain them. Paint them, put in glass doors or leave them as they are now. A solid real wood cabinet stands the test of time…u like most others. Look for quality even if you just admire it as a base to work from. *Love * The glass idea–thx for external links! Totally going to do this! Kelly, thank you for letting me know that my advice is working 🙂 I love to hear feedback like that! Hi thank you for the ideas. I too have solid oak cathedral cabinets that we remodeled and installed in 1993 . There is a beautiful stain I saw that is light grayish color that allows the grain to show by Minwax. I think I’m going to sand down the sheen on my cabinets and stain them. It will be pretty I think, and add the knobs and pulls. Modern update without painting them a solid color. I love solid wood! Kylie, love this website! I have a love/hate relationship with all the oak in my home and especially the kitchen. I’m happy to know there is an expert who supports painting the island. I have been color paralyzed for 2 years for this makeover. What color suggestions do you have for painting it? Thank you for some ideas. My cabinets are exactly like Julia Blanner’s. What are your thoughts of adding cabinet black crown mounding with an oak inset, cabinet light rail in black and then black hardware? Counter tops would also have some black to tie all together. Your thoughts. Thanks.